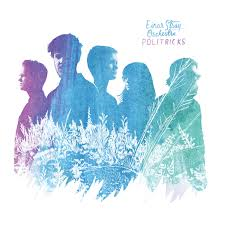 The Norwegian quintet, previously under the moniker Einar Stray, release their second album, Politricks under a new name – Einar Stray Orchestra, whether intentionally or unintentionally, suggests something much more of a classic origin. Their music certainly is something very special indeed; I haven’t heard anything so beautiful and captivating in a long time. I can honestly say I have fallen utterly and irrevocably in love with them within mere minutes of the first track. I’d be willing to bet I won’t be the only one. My only regret is that I hadn’t paid any attention to them before now. Einar Stray Orchestra begin what is totally one of the most spectacular albums ever recorded with ‘Honey’. It is, on first listen, a little jarring and seems irregular – almost random – but when more layers are introduced, it all comes together finally. Stunning, multi-layered and complex. ‘Honey’ lasts for eight minutes, but it seems much less. Under other circumstances, I would probably dismiss an eight minute track as ludicrous and obnoxious, but Einar Stray Orchestra play eight minutes of pure, mesmerising beauty. ‘Pockets Full Of Holes’, is on the surface at least, light on its feet with a jaunty, cheerful and upbeat melody, however, when coupled with the words “Will I die inside before I die?” repeated over and over, it gives it a far more sinister twist. Fourth track, ‘Thrasymachus’ has much the same rhythm and quality as the previous tracks, continuing to thrill with its brilliant and complex melodies, and layers upon layers of sound that is almost hypnotic. ‘For The Country’ is much more stripped back than the others before it. Lyrically, it’s both unnerving and incredibly, terribly gorgeous with lines such as “The terrorists will hunt me down’ and “Bullets in the bellies of our babies”. This time there is so much more emphasis on the vocal arrangements that possess a folk-like quality. It takes a while to realise that there’s no accompaniment, just vocals, to stunning effect. ‘Montreal’ is upbeat in both the rhythm and its bright, skipping melodies than almost seems to trip and tumble from beginning to the end. It still the same complexity in the many layers of sound. Penultimate track, ‘Qualia’is much easier-going than some of the other tracks on the album, with its truly breathtakingly beautiful folk-inspired melodies and slow and steady tempo. All in all, Politricks is absolutely enthralling and a real joy to hear.